The Gotham City Police Department has just gone through somewhat of a rough time. Gordon is on the warpath with the episode opening up to him throwing some “mooks” (Bullock’s words not mine) out of a couple of windows. I for one am enjoying Jim’s return to his brashness that makes his character so wonderful to view on-screen. His primary goal is to find Jerome”the Joker” Valeska. The main focus of this week’s episode is to push the Joker into the light or is it? Jerome’s money man Galavan let’s us in on his past. Now, the Joker’s story does actually begin here. It’s does not turn out how we thought it would, but it is very satisfying to see the twist they throw us. 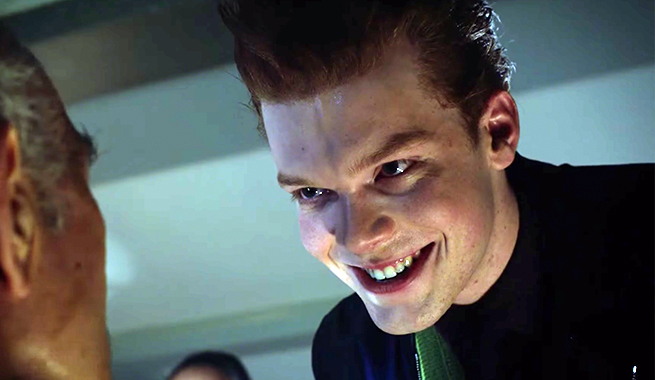 Cameron Monaghan’s performance is fantastic. They give him very large “Batman” type stage to set up his final act. The quote of the show is “I hear there is going to be a magician.” It has a somewhat ominous foreshadowing throughout. The music during the sequence is very Batman and Robin, almost scary. It’s very Joker-ish. We get some Bruce and Alfred time, some Barbara and Lee time, and some Alfred and Lee time. Most of those portions could have been cut and wouldn’t have been missed, as is usual when they throw in characters for the sake of giving them screen time. Every show needs some subplots that actually work, though. This week Bullock confronts Penguin. We are reminded of Oswald’s beginnings during the sequence. I am wondering if his rise to power is too soon too much. The season is called Rise of the Villains. Where there is a rise, there is a fall. Perhaps he is not as secure on the top as one might think. The show makes a fantastic turn to push the Joker mythos into another direction we weren’t expecting, but makes plenty of sense. It easily pushed it well above the first two episodes of the season. We doubt this is the end of the Joker’s origin this season, so it will be awesome to see where it takes us.